Members of the Urbana Fire Division read to Urbana Elementary School students recently. The program’s goal is to introduce firefighters to students. 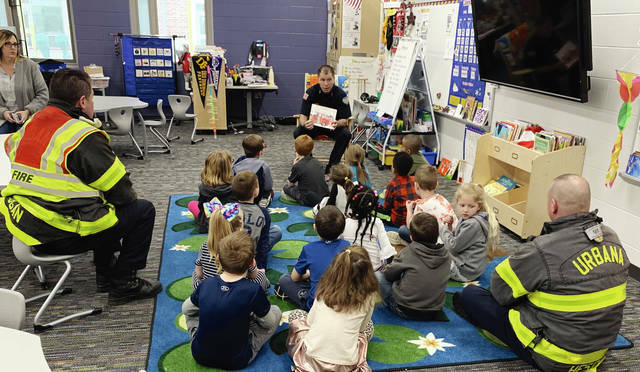 The Urbana Fire Division, in partnership with Urbana City Schools, has started a guest reading program where the division’s firefighters read to local school children. Urbana Fire Chief Dean Ortlieb said the program is part of the division’s overall plan of investing time and energy with the community’s youngest members. One of Ortlieb’s goals is getting school children to know firefighters by name and to not be timid or shy when approaching them in an emergency or any other time they see them. Ortlieb said a lot of credit for the program goes to Urbana Elementary School Counselor Gina Lingrell. Ortlieb added he wants the community to know that they are much more than a 911 emergency response system. “Many of the division’s members live in the community and all our members want to support and help the community any way they can,” Ortlieb said. “The Urbana Fire Division has a civic responsibility to provide services to fight fires and save lives. During the first meeting with Lingrell, Ortlieb discussed the division’s willingness to become more involved with the school which started the school engagement. The parties have collaborated on several options. These feelings were reinforced later that evening when Ortlieb was talking with Urbana City Council President Marty Hess and he mentioned firefighters reading to students. Ortlieb wants the reading program to be the first of many encounters with local students.